I was enjoying the very hot weather with my children today and we came up with a brilliant idea to keep us cool plus it got my little ones very much involved. My children are aged 5 and 6 and they loved this craft activity. You will need some plain paper say A4 (office paer) and some glue scissors(only for mums to use), . Then some differnt materials, things like shiny paper, gummed paper, I also cut up some small peices of felt. Also use some tissue paper we used bright summer colours like yellow, red, orange and last of all some glitter. I then cut the materials into various shapes ready for my children to now stick onto the paper. Of course dont forget to give your little one the glue stick, paper and let them place the glue onto one side of the paper. Then you should have a A4 paperfilled with lots of colourful materials. Now let this dry a little then mum start to fold the paper like a concertina backwards and forwards, with all your childrens designs on. Last of all at one end wrap around a length of ribbon covered with glue. Or you could just use an elastic band. Now your child can keep cool with their own fan. My children loved their fans and we have made quite a few have a look at my pictures. Join in and write your own page! It's easy to do. How? 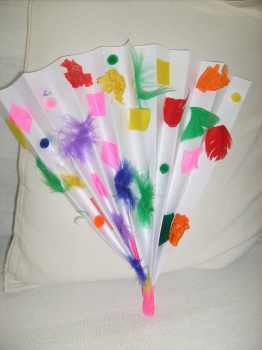 Simply click here to return to Summer Crafts for Kids.